Batman: Arkham Origins was not terribly well received when it came out, because fans felt it didn't live up to the standard set by the first two games. But since then, Arkham Knight has come out, and it was such a let-down that it makes Origins look better in retrospect. Quinzel is finishing up her psychiatric residency at Blackgate Prison. It seems odd that a student would try to work at a facility that has little desire to rehabilitate its inmates, but perhaps her interest in the criminal mind will bear fruit. That, students, is a little literary device called "dramatic irony" - it's when the audience knows something the characters don't. We all know that Dr. Harleen Quinzel's interests will really bear fruit, but definitely not in the way that Batman was hoping. While older examples of dramatic irony tended to opt for pure comedic effect ("oh, male friend who looks suspiciously like a woman in drag, if only I could meet a girl who's just like you and date her!") or dramatic tension ("Romeo, you fool, she's not actually dead, don't kill yourself! "), modern versions hover somewhere between the two extremes, looking to mildly unsettle the audience - to be cringeworthy, in other words. Dr. Quinzel's future is plain to us, so we see the irony inherent in the statement, and we feel bad for Batman. There have been plenty of Harley Quinn toys over the years, but this is the first Harleen Quinzel. She's dressed in her usual colors - red and black - but it's just a normal blouse and skirt. She's wearing red heels with black soulds, and her belt buckle has a diamond pattern. 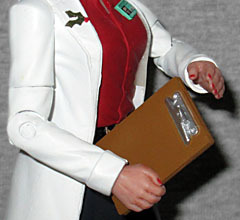 She's wearing dark pantyhose, and her white lab coat is accessorized with a spring of holly. Like the first Arkham Harley toy, this one is wearing an ID badge, but this time it's her own. Harley's blonde hair is pulled up into a bun, so it doesn't get in the way of her neck balljoint. The figure also moves at the shoulders, biceps, elbows, wrists, thighs, and knees. There are also hip joints, but they don't move far because of the skirt. Her glasses are permanently attached to her face, so her only actual accessory is a simple clipboard that can be clutched in her right hand. More brawn than brains is the initial assessment of Buchinsky, but he has been able to create some kind of custom-made weaponized gloves that pack a powerful electrical discharge. Their craftsmanship suggests there is more going on between his ears than the sound of his own boasting, though he may have had help constructing them - perhaps even had them made by someone else. His arrogance and overconfidence are his weakness. Wow, you know the Arkham games are really hurting for interesting villains when they resort to using Electrocutioner. Arkham Origins' tagline was "your enemies will define you," but that's not super impressive when your enemies are guys like Electrocutioner or Firefly. He started out as a vigilante who killed criminals who slipped through the system, but apparently eventually just went full-on villain. His biggest claim to fame in the comics is that he successfully killed Batman (for about two minutes, until Robin convinced him to defibrillate the Dark Knight). His design definitely fits the aesthetic of the game, and yet it has strong ties to the comic costume - in the books, he wears a black suit with a red X on the chest and red stripes down the arms; the game keeps the suit dark, keeps the stripes red, and has what would probably be an X if we could see his entire torso. The side of his face is covered by a large Lichtenberg scar - not quite Two-Face bad, but it's close. Phil Ramirez clearly sculpted him based on early designs, because the final renders in the game aren't quite as messed up as this. The gloves, though, really do look like mechanical devices that have been assembled, not just magic sci-fi taser gloves. 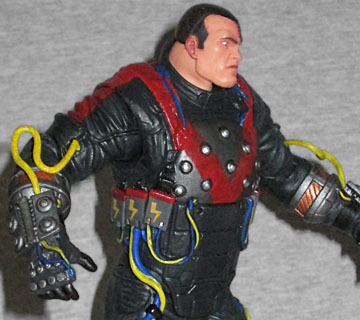 Electrocutioner's suit is thick and presumably insulated. There are protective (metal?) pads on his knees and chest, and heavy industrial wires running all over his limbs. Because his power has to come from somewhere, there are big batteries literally hanging from his suit. They're all wired together and run to what is probably a capacitor on the small of his back. 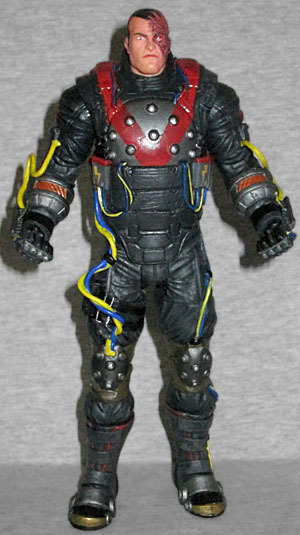 The wire that runs to his right knee, as well as the wires running directly into his gloves, are actual PVC tubes glued onto the toy. Electrocutioner moves at the neck, shoulders, elbows, waist, hips, knees and boot tops. The knees are double-hinged, which is surprising. There are also swivels at the top of his gloves, because the toy includes alternate hands: he's normally got fists, while these are open. Why include such a thing? No idea, honestly. Maybe just because there was nothing else to give him. Police records are thin, but indications are that Shiva is highly trained and extremely dangerous assassin. Rumor is that she selects many of her targets simply to test her skills. There are no known survivors from these encounters. The threat she represents cannot be underestimated. 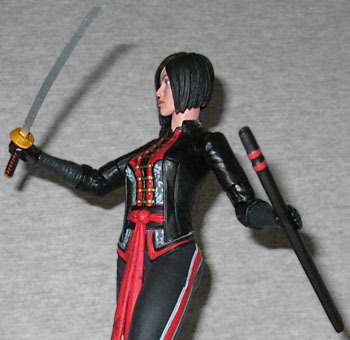 Lady Shiva! We are now three-for-three on characters who have never had any kind of toy before! One of the most accomplished martial artists in the DC Universe, comicbook Shiva has been a trainer for lots of the Bat-family, though she's always a little disappointed none of them are willing to kill. In Arkham Origins she's a member of the League of Assassins working for Ra's al Ghul, and if you listen to all of Riddler's blackmail tapes, you'll find that she's the one who set in motion the events that led to Arkham City. The game version shares her comicbook counterpart's red-and-black colorscheme (Old 52, at least; New 52 is teal), thanks to the fancy shirt she wears. Between the gold fasteners and the white floral pattern, this is some intricate paintwork! Like Harley, Shiva was sculpted by Jonathan Matthews. The videogame version has a short bob haircut, rather than the long hair she normally sports in the comics - most likely because long hair is harder to (computer-)animate and Origins really didn't need anything else that was going to glitch out. Plus, she's had hair shorter than this in the comics, so it's not without precedent. Another thing lost to animation difficulties? Her coat. In the concept art (as in the comics), Shiva wore a knee-length jacket, but that was turned into a close-fitting version that stops at her waist. She still has the long sash-style belt, probably because that would work like a ponytail. She has a balljointed head and shoulders, swivel biceps, hinged elbows, wrist swivels, a T-crotch, hinged knees, and boot swivels. That's an average amount for a DC Direct figure, but it's not enough for someone who is supposed to be the greatest martial artist around. She can hold her sword in her right hand, but there's nothing to be done with the scabbard. So often multi-packs force us to buy previously released figures in order to get something new. For instance, if you wanted Arkham City's Hammer and Sickle, you had to re-up on Harley Quinn and the Penguin, and if you wanted Copperhead, you had to get a Joker and a Deathstroke (who at least had new heads). But this set, featuring Dr. Harleen Quinzel, Electrocutioner and Lady Shiva, not only gives you three characters who haven't appeared in this line, it gives you three characters who haven't appeared anywhere! That's too good to pass up.